Royal Ascot, the most anticipated event in the horse racing calendar, takes place from Tuesday 14th – Saturday 18th June. Five days of socialising, fine dining, style, and of course races! Whilst eyes are certainly on the horses and jockeys Royal Ascot is also synonymous with sartorial elegance. The event upholds a strict dress code that requires men to wear black or grey morning dress in the Royal Enclosure. That includes waistcoat and tie, black or grey top hat and plain black shoes. In the Queen Anne Enclosure men are required to wearing a matching suit with shirt and tie, whilst in Windsor Enclosure smart dress is encouraged. There is a surprising amount of choice and personalisation you can bring to this traditional attire to make you stand out from the crowd. Believe me, wearing such a suit makes you feel so special that it can only add to a great day out. It did with mine last year! To celebrate the event we’re offering £200 off a two-piece or three-piece bespoke suit for a limited time only! The offer is valid until Thursday 12th May. 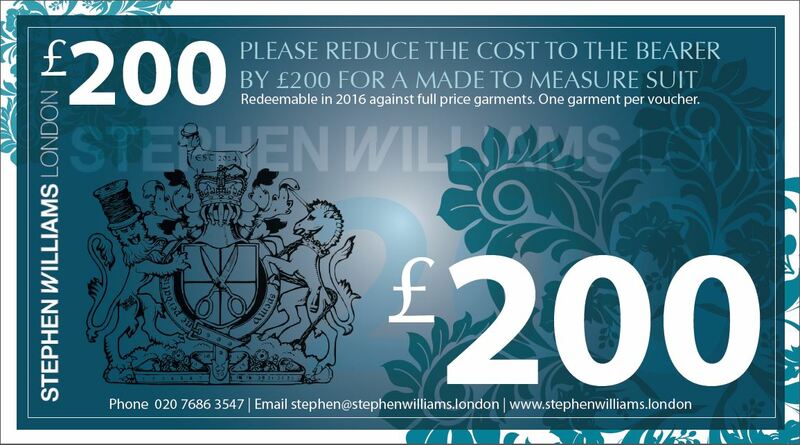 Call my London design studio on 020 7686 3547 or email roderick@stephenwilliams.london to discuss your requirements. For some the advent of Spring brings along many social occasions and many of us love a bit of a bet on the horses. If you’re attending the races it can be a dilemma as to what to wear. Many events demand the more traditional morning suit with tails which is a style I specialise in. And as you can see from the photo below I very much enjoyed my time at Royal Ascot last year! There is a surprising amount of choice and personalisation you can bring to this traditional attire to make you stand out from the crowd. Believe me, wearing such a suit makes you feel so special that it can only add to a great day out! Rugby star Thom Evans (above) set hearts racing earlier this month when he wore bespoke Stephen Williams London to ladies day at Cheltenham Festival. I’m looking forward setting up my Pop- Up shop in one of London’s most iconic restaurants L’Escargot in Greek Street, Soho, this Wednesday (13th April) from 2pm. I’ve a long association with the restaurant and use one of the rooms to meet clients if it’s more convenient than visiting my Design Studio in Shoreditch. The hospitality there is second to none and they serve a mean breakfast too! One of the most fantastic things is that you can take your dog with you. So you’ll find me with the lovely Hope who gets the opportunity to drink from a silver plated dog bowl, if you please. Next week I will be showcasing some of my new Spring/Summer Collection as well as some new exclusive fabrics in the luxurious surroundings of the Salon Noir. I will be able to advise you on how to get the most from your summer wardrobe, what the key trends are, as well as offering a generous discount to new customers as you can see in the note below. Click here to download your gift voucher. Please print off or show on your mobile device at the event to claim. You’re invited to pop down, say hello and treat yourself to a Beautifully Bespoke Garment.